Please join me on November 2nd at 5pm for a complete LIVE update on all the research! This past summer, an exciting research study was published in the Journal of Complementary and Alternative Medicine. It cited the use of PEMF, pulsed electromagnetic field therapy for the improvement in bone density and better regulation of lipids (this means better cholesterol and less need for statins). The report specifically said, “The results suggest that PEMF stimulation can prevent bone loss and improve lipid metabolism.” Here is a link to the study Pulsed EMF Field on Bone formation and Lipid Metabolism. Join me on November 2nd at 5pm Pacific for the latest research in PEMF technology! More about the best proprietary wave and optimal frequency in PEMF! PEMF stands for pulsed electromagnetic field therapy. These fields are on the ELF spectrum (extremely low frequency). This is the application of a specific frequency, on a particular wave, that can impact the human energy field and body through a process called resonance. This means that when you are close to a PEMF mat (laying on the mat or sitting on the mat), the specific therapeutic frequencies can impact you in a very positive way. It is as simple as that. All you need to do is receive this frequency! It turns out very smallest vessels of the body, called the capillaries, have their very own healthy frequency! The capillary system in the body comprises over 80% of the entire circulatory system of the body! What happens when we don’t have good circulation? We can end up with conditions like Alzheimer’s, heart disease, blood pressure, decreased mental clarity and much more! For example, the natural frequency of the earth is 7.83 Hz. This is also known as the Schumann resonance. The coherent, optimal frequency of the capillary? That would be 10Hz! Find a PEMF mat that produces 10Hz and you are on to something. It turns out that the proper application of the 10Hz frequency (with a strategically designed carrier wave!) can switch on a capillary that has switched off! Yes, read that again! A capillary that is experiencing stasis, that has been switched off for some reason, can become enlivened once again with the proper application of the 10Hz frequency. This is exciting beyond comprehension! Opening up circulation in the smallest vessels of the body is like being given new life! After all the capillaries are designed to deliver oxygen and nutrition to our precious cells! If there is no movement of this precious nutrition due to defunct capillaries, it doesn’t take much to realize that the cells will begin to die! So, revitalizing and optimizing the functioning of capillaries is one of the keys to longevity! What type of PEMF mat should I use? The only PEMF mat that I use personally and recommend in my practice is the Bemer mat. This mat has a very special propriety carrier wave that brings your capillaries that precious 10Hz frequency. It does that and something even better. Every few seconds, the Bemer mat also generates a very brief 30 Hz frequency. This alternation of the longer 10Hz frequency and brief 30 Hz frequency causes the capillaries to open up more efficiently. What would I experience as a result of this advanced technology? When your circulation opens up, you could reasonable expect to experience less pain (“Pain is your body’s request for oxygen.”), more mental clarity, lower blood pressure, improved mood, deeper quality of sleep and much more. None of these are guaranteed effects, but they are certainly my experience and the experience of my patients. Does using the Bemer take alot of time? Not at all! The most effective way to use a Bemer is to use it twice a day for just 8 minutes per day! I personally keep my mat near the bed and use it first thing in the morning and last thing before bedtime. Please join me on Wednesday, November at 5pm for a free webinar with the latest research! Register here. You can also read more about the Bemer mat here. If you sign up for the class, you will receive the recording automatically in case you miss the live session! Have you done any webinars before this that I can watch right now? Remember to join us on November 2nd at 5pm Pacific! This is a free webinar that covers the very latest information in PEMF therapy! Check out more information about the Bemer mat! What’s so great about CBD Oil? Is this another form of wacky weed? Nope. CBD Oil or cannabidiol oil may be one constituent of Cannabis Sativa, but it is not the psychoactive one. That’s theTHC. Can you get CBD without THC? Yes, you can. This is what you can derive from the hemp plant. In the U.S., though you would not be able to grow your own hemp, it is perfectly legal to purchase it and to take CBD oil. Why would I be interested in CBD? CDB, or cannabadiol oil is a powerful substance. It is not a psychoactive substance and it is not addictive. You can also get CBD in the marijuana plant and derive benefit from it with a very low percentage of THC. Much of this production is happening now because of the legalization of pot in several states. This article, however, will deal only with CBD derived from hemp. Decreased levels of anxiety and regulation of the hippocampus. Regulation of insulin, ghrelin and leptin levels (which can be helpful for weight loss). Reduced levels of inflammation in the body, and typically as a result less pain. Healing of the gut, including research that shows considerable improvement in irritable bowel disease. Positive effects on the brain in a variety of ways. One of the known positive effects is the reduction of seizures which has successfully helped epileptics and has been one of the leading uses of CBD derived from hemp. It may have profound effects on cancer, although those have not yet been researched extensively. We do know that CBD seems to have a positive impact on the immune system including the improvement in T Helper cells and cells that generally help to destroy cancer cells (like NK cells). Epileptics are one of the leading groups using and benefitting from CBD oil. This tells us that CBD probably has a calming or modulating effect on the electrical systems of the brain. When you think of your experience with pot, or the stereotypical experience, you can imagine folks to have their anxiety (paranoia even!) ramped up. Some people are afraid to smoke pot for this very reason! However, it is the action of THC to increase brain chemicals that could cause this increased feeling of anxiety. CBD has the opposite effect. It can be very soothing and calming. A 2013 study on stress and CBD found the following: activation of the cannabinoid receptor with CBD helped to reduce the effects of stress on the brain. It is this repeated stress on the brain that can cause physiological changes (to the hippocampus and the amygdala) that can lead to anxiety and depression. Specifically, the study found that, “CBD…significantly reduced expression of glucocorticoid receptors in the amygdala and hippocampus…Our findings suggest that cannabinoid receptor activation could represent a novel approach to the treatment of cognitive deficits that accompany a variety of stress related…disorders.” (Journal of Neuropsychopharmacology, July 2013). To really understand the impact of CBD, it is essential to understand something called the endocannabanoid system. This is a group of receptors that was literally named as such because of their effect on the ECB receptors in the brain. This system plays a crucial role in regulating our physiology, our mood and how we experience the world around us. The simple truth is that CBD oil helps to regulate these receptors in a very positive way. Because CBD from hemp has no psychoactive (THC) side, the benefits are positive and the substance is not addictive. CBD can profoundly modulate your immune system. This is something we will all find very helpful in an age where both chronic infections and autoimmune disease are concerns for many people. In the Journal of Leukocyte Biology, it was reported that the EDC receptors, when stimulated by CBD, may help to regulate T Helper cells and inflammatory cytokines. How can you start using CBD oil? I personally recommend the resinous form of CBD over pills or tinctures. I find that these have the best pricing for the amount of CBD you receive and the least amount of filler. You pay for the CBD and that’s it! You can take as little as 10mg per day. That is just a very small amount, like a dab on your finger. Would you like to more about CBD oil and how to use it? Join me for a free live webinar on Wednesday, November 9th at 5pm Pacific (8pm Eastern). To register, sign up right here <<< Sign up here to register. Raise your vitality through your kidney health! What is your current kidney health? Have you had it assessed? What does all of this matter, anyway? Your kidneys among the most important functioning organs of the body. They receive a quarter of all the cardiac output in the body! They do a tremendous amount of important work for the body. What is concerning is that kidney disease is quickly on the rise. Why? How can you prevent it? Chinese medicine also focuses on the jing energy. Focusing on jing is immensely important. What do you do to preserve and maximize kidney jing? Certain herbs, such as astragalus, reishi, ginseng rehmannia and more are absolutely basic requirements for your long-term vital health. Register now for Kidney Wisdom with Dr. Ariel! <— click here to register! The kidneys also help with blood pressure regulation. Do you often feel bloated? Do you find that your blood pressure has been going up and feel helpless to control it? The truth is that your kidneys regulate the fluids in your body. If you help your kidneys to do the job they were meant to do (with certain herbs, like juniper berry), you will find that you may have a slimmer tummy…and a lower blood pressure reading. The pervasive use of NSAIDS like ibuprofen and the tendency for people to not drink enough water or use caffeinated drinks as a substitute is all contributing to decreased kidney function.. What is going on with your kidneys? What are the most important lab tests to have done? What are the most important things you can do to maximize your kidney health? Learning how your kidneys work from a Western perspective, along with understanding how Chinese medicine views the kidney system and understanding some basic herbs and nutrition for your kidneys could make all the difference in the world. Class 1 The Physiology of your Kidneys, Recent studies on the impact of Ibuprofen on kidney health, important lab values for kidney health. Class 2 Herbal Medicine and Nutrition for Kidney Health, including Unda Drainage remedy information and special Gemmotherapy for the kidneys. Class 4 Broths for kidney health, Herbal tonics and teas, special exercises and practices to maximize kidney health. Special cellular healing visualization for kidneys. Please join us for this incredibly powerful series by registering here. The series will be recorded and available for you to listen to as many times as you wish. This may be one of the most important series you attend! 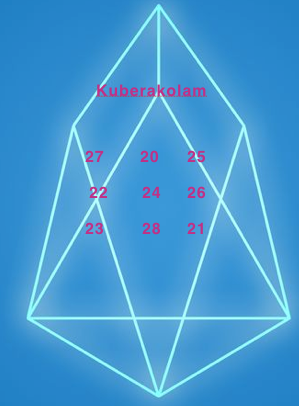 The Kuberakolam is a numerical sequence. It is based on the Hindu god, Kubera, the god of wealth. The kuberakolam is typically drawn with rice flour on the floors of houses in South India (the kolam is a sacred form of painting using rice flour). It is meant to bring good energy into the home and to welcome abundance. Here it is just meaning this particular form of the drawing, shown below. The magic numbers, in their particular arrangement and in 3 rows and 3 columns are known as the magic square. This order and arrangement creates a frequency. That frequency draws prosperity, good fortune and financial success. Each row and each column (up, down and the main diagnonals) all add up to 72. This is a sacred number and there is a coherence to the entire square in the 72 being represented along all of these lines. Viewing the magic square and meditating on the numbers is what connects you to the energy of prosperity. I have taken the Kubera number sequence and superimposed in on Frank Chester’s chestahedron. The chestahedron is a represntation of the energy that permeates the heart. It is a vortex. There is a similar vortex giving power to the left ventricle of the heart. Combine the connection with, and clearing of, the heart with the desire to manifest prosperity. The result: manifestation that is in alignment with your highest self. Try meditating on this Kuberakolam each morning as you review or focus on your daily goals, aspirations and intentions. Kubera also has some specific mantras. Reciting these mantras also are powerful sacred sounds that attract money, abundance, good fortune and success. Please share your comments below about how you feel after meditating of focusing on the Kuberakolam, the chestahedron sacred geometrical shape or the Kubera Prosperity Mantras. Here’s to your success and abundance! What is Pulsed Electromagnetic Therapy (PEMF)? Have you heard of EMF’s? Many of my clients have heard me talk about electromagnetic frequencies. In that case, we are talking about frequencies that are generally not beneficial. Those are the ones that come from the wireless internet, from cell phones or from cell towers. Because people are more aware of EMF’s, they sometimes get confused about PEMF. Pulsed electromagnetic frequencies are different, though. These are therapeutic energies that can have highly beneficial effects on human physiology. Increased health at a cellular level. More efficient ATP production from mitochondria. Healthy resting cell membrane potential. Better excretion of waste at a cellular level. Jerry Tenant said in his book, “Healing Is Voltage”, that we are electrical beings before we are chemical beings. After 12 years of clinical practice, my observation is that energetic therapies can often reach to places that supplementation can not. It if for this reason that I am continuing to do research in therapies like PEMF.